Established in 1976, The 14,000-acre Minnesota Valley National Wildlife Refuge is one of fourteen Regional Priority Urban Wildlife Refuges in the United States. With trailheads located just blocks from the Mall of America, the site is an easily-accessible wilderness escape for residents of the Twin Cities and surrounding suburbs. Visitors come to explore wetlands, forests and prairies; view wildlife; and partake in hunting, fishing and other recreational activities. The refuge is an important habitat for fish, reptiles, insects and migratory birds. To maintain healthy wildlife populations, and preserve the habitats on which these species depend, the U.S. Fish and Wild Service (USFWS) must collect and analyze a great deal of data. Regular surveys of habitats and wildlife populations help USFWS know where to focus conservation efforts, and document the effectiveness of management actions. To help collect this vital data, USFWS partners with Conservation Corps Minnesota & Iowa (CCMI) – a 21CSC Member Organization – to place interns at the refuge. This summer, 24-year-old Corrie Nyquist of Cokato, MN served as a CCMI AmeriCorps intern at the refuge. A graduate student in the Entomology Department at the University of Minnesota, Nyquist studied aquatic insects and trout food webs. 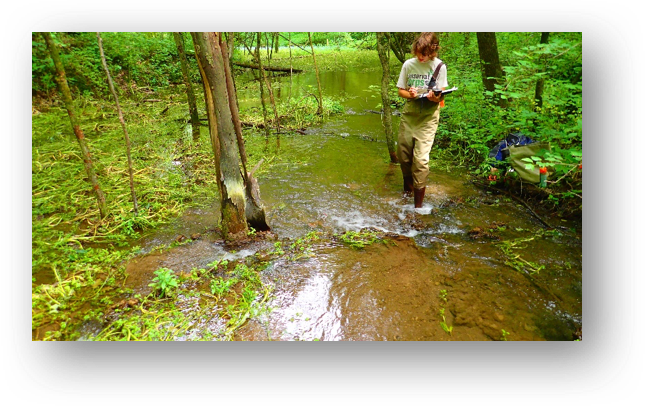 Among other activities, her internship at the refuge involved a trout stream monitoring project, as well as surveys of various plant, insect and reptile populations. Specifically, Nyquist studied how air and ground water temperatures affect when and which types of aquatic insects emerge. These insects are a critical food source for trout, so their abundance and diversity are essential to trout survival. Nyquist was also involved in surveying for the endangered rusty-patched bumblebee. This involves catching live bumblebees as they forage, then releasing them after identification can be made. As pollinators, bees are critically important to many other species in the ecosystem. Additionally, Nyquist helped the refuge restore several oak savannas. Following prescribed burns and clearing efforts, Nyquist monitored which plant species grew in the understory, and gathered data on the canopy cover. After completing her master’s degree, Nyquist hopes to pursue a career in conservation, preferably working in aquatic environments. It was a beautiful warm June day and the little stream was running crystal clear along its winding, cobbled channel. Brook trout darted into the shadows offered by a low bank of tangled tree roots and watercress. Meanwhile, an airplane flew noisily overhead, and for a moment, the lush, green silence of the ravine was split by the roar of the engine. This is the uniquely urban setting of Ike’s Creek, a small trout stream on the Minnesota Valley National Wildlife Refuge. I am privileged to be able to study this stream for my master’s degree in Entomology. During the last week if June, I was able to go out on the stream and officially begin my master’s project by placing temperature loggers. These loggers will stay out on the stream until April, documenting the seasonal temperature changes of the water, from the headwaters to the mouth. The data from the temperature loggers will aid me in studying how the ground water inputs may buffer the stream’s water temperatures as the seasons change and allow for seasonal insect emergence. Placing the temperature loggers was a great step in my project. I have been planning the project and working with various partners on it since last March, so it is very exciting to see it starting to come together! While most of the creek is on National Wildlife Refuge land, parts of it run through private property and land owned by the City of Bloomington. To begin studying this stream, I had to obtain permits from the city, private owners, and the refuge. It has been challenging and exciting to work with the different groups and see them come together on the common ground of wanting to know more about the stream. My work with the temperature loggers was also facilitated by the Minnesota DNR, which has historically collected data on the water temperatures and trout in the creek. Collaborating with the Minnesota DNR on this project has offered me the opportunity to work with another natural resource agency and broaden the scope of my study since I will also be able to participate in their annual Ike’s Creek trout survey. Although my study has just been officially running for a month, there have been numerous opportunities for collaborative work at the local, regional, and federal level. I am learning how to organize my work with the different partners and how to strategically plan data collection and sharing. So far, it is an exciting opportunity! Similar to the creek, it hasn’t always followed a straight course, but that has made the journey all the more engaging. 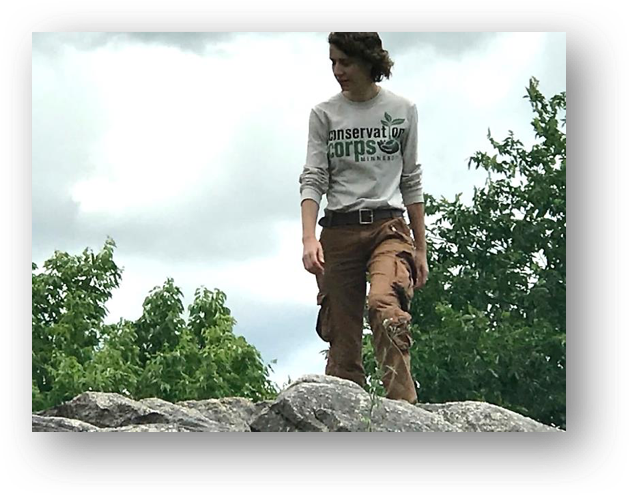 This entry was posted in Habitat Restoration, Partnerships, Rivers on September 19, 2017 by Hannah.